The Arbor Place Bedroom Collection by Liberty Furniture bridges the boundary between formal and casual, elegant and relaxed, classic and fresh. A combination of bold and dramatic scaling with soft shapes creates a casual traditional style. The Arbor Place crafted from poplar solids and birch veneers. A nice feature is the center hidden drawer disguised as a center step molding. Attention to detail is noted in the carved accents and custom designed drop ring and knob hardware. 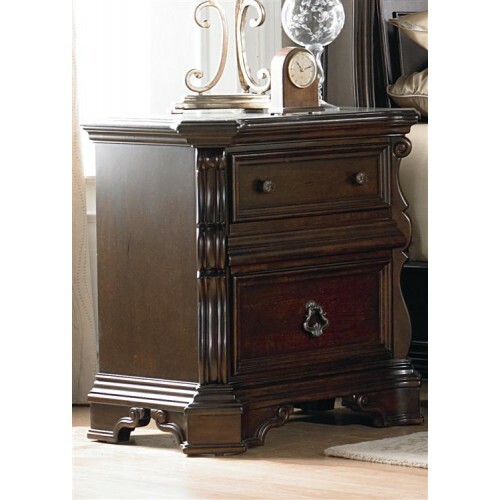 The nightstand features fancy face 4 way match veneer top, full extension metal side drawer glides, English dovetail construction, felt lined top drawer, fully stained interior drawers, felt lined hidden drawer, bottom case dust proofing and scrolled bracket feet. From the classic brownstone finish to the elegant details, this collection is certain to become a standout item in your bedroom.